Friday and Saturday was spent with Silvy in Neve Daniel. 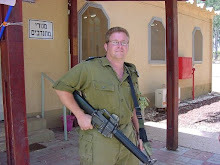 If you have been reading my blog for a while you know that I made connections with several people in Neve Daniel through the process of preparing for my move. Silvy has been wonderful and sho wed me aroun d Gush Etzion and provided a wonderful Shabbat. I didn't thank her enough for the great weekend. We first went to Kibbutz Kfar-Etzion, a central piece of the area's history. There they had a video presentation of the history. The Kibbutz makes camping gear as well as Naot sandals. I needed new sandals so I got a pair. Without going into the whole history of the area, there is a tree that was there from the early settlement of the area before the arabs seized the area in 1948. The tree was visible from Jerusalem and the survivors longed from afar by looking at this lone tree. We also went to a local restaurant, Gavna, that started as a single caravan (trailer) and has expanded many times and has a dining room and patios that all have an amazing view of the area. I also took some pictures from Silvy's house where the view is equally amazing looking towards Jerusalem. We returned to Silvys to have a driving tour of Neve Daniel and returned to Silvy's to prepare for Shabbat. Silvy did most of the preparations and her mother prepared the table. We went to services at a home on the far side of the yishuv that offered a Carlbach style service in the basement of a home that is also a small shul. There were probably 80-90 people crammed into this small space and overflowing outside. I saw Josh Sussman there, so it's real neat to be in such a new place and to see people I know. The service was quite moving and spirited, even to my shock there was clapping. We returned to her house and she made a fabulous meal, I even tried the eggplant, not my favorite. Shabbat morning, we went to the "local" shul, a doublewide caravan that is a temporary home of the shul until the permanent building is completed. Neve Daniel has a large main shul at the top of the settlement, but as the community has grown there is a need for a another shul. There was also an overflow crowd and a government minister, Edelshtein, was there. We returned to a wonderful lunch of sushi and Sheppard's pie. We sat on the porch overlooking the valley below and enjoyed the cool breeze and relaxed. We visted a family across the street for a while and enjoyed their hospitality.